Tom Ford presents Atelier d'Orient, a collection of four Private Blend fragrances inspired by the sublime beauty, enigmatic sensuality and exquisite luxury of Asia. Each scent tells his richly imagined olfactory story about Asia by using ingredients that have treasured prestige in the Orient, from voluptuous florals and precious fruits to aromatic spices and rare oils. In Atelier d'Orient, prized ingredients from the ancient silk and spice routes are crafted into unexpected new architectures as beautiful and daring as the region's mesmerising, modern cities. Tom Ford says, "This collection is quintessential Private Blend: It is an olfactory exploration of Asia's fusion of cultures and influences that is extremely beautiful, quite unexpected, and a reinvention of the region's most precious ingredients. Atelier d'Orient is an artisanal collection that captures subtle qualities of Asia " its elegant discretion, refined mastery of details and classical eroticism." Enlivened by a dynamic play of tradition and invention, the four Private Blend fragrances capture four distinct moods: Captivating romance; colonial elegance; luxurious exoticism and richly mysterious sensuality. 'For Fleur de Chine, I imagined the romantic and mysterious women from Asia's cinematic past "from the '30s femme fatale in a cheongsam and dark lipstick, to the'60s Hong Kong heroine of In the Mood for Love. I wanted to capture that fascinating, exquisite and slightly scandalous femininity." –Tom Ford. Fleur de Chine is an unequivocally romantic and haunting, floral fragrance that is touched with reverence for the great fragrances of the past. It evokes an atmosphere of sophisticated restraint that evolves slowly into rich grandeur. Precious Asian flowers, including the HuaLan flower and star magnolia, are arranged in a bouquet of rare beauty. Their romance is enhanced with the elegant texture of fresh clementine and bergamot, blended with the soft, green effects of hyacinth. Sublime Eastern treasures " jasmine tea, syringa, plum and tea rose balanced with wisteria, white peach and soft tree peony " whisper a story of insatiable longing. This medley of sophistication and sublimity keeps the fragrance blooming with presence. Yet the richness of hinoki wood, Chinese cedarwood, amber, rare benzoin Laos, styrax and vetiver tempers the beauty with captivating seduction, adding an aura of glamorous mystique. 'In reading about the Orient's rituals and history, I became entranced with the refined art of gift-giving. Rive d'Ambre is inspired by the tradition of presenting precious citrus fruits as gifts. True to my nature, the sparkling fruits are wrapped in rich and warm sensuality." " Tom Ford. Rive d'Ambre is a golden-toned eau de cologne with a veil of colonial elegance. Precious citrus fruits " a talisman of good fortune in Asia " are beautifully illuminated by a warm and seductive, amber background. Exquisite citrus fruits " bergamot, lemon and bitter orange oils " dance together with refreshing and refined light, surrounded by the uplifting textures of tarragon, cardamom and Moroccan spearmint oil. The bergamot weaves itself into these contrasting ingredients with aromatic splendour; in an unexpected twist, this citrus gift is cradled by the rich and seductive warmth of rare benzoin Laos melded with a beautiful, pear wood accord. A decadent pour of cognac oil touched with tolu balsam enhances the golden aura, which is made even more fascinating with the addition of addictive amber. 'I have always been fascinated by unusual ingredients from exotic cultures. The ume plum is an exquisite ingredient that has great meaning in Oriental culture; in Japan and China, it is a sacred symbol of Spring. I wanted to craft a fragrance around the ume, because it has a texture and aroma that is so luscious." " Tom Ford. Plum Japonais reveals the extraordinary beauty of the ume plum by juxtaposing it with a lush and unconventional mélange of exotic Asian ingredients. Plum Japonais is a rich and luxurious fragrance for true scent connoisseurs. Saffron, cinnamon bark Laos, everlasting flower and sawara cypress create an unforgettable journey across distant lands. The voyage unfolds from India to Laos and then to China and Japan, where the tart, dark nuances of ume plum are discovered. This breathtaking ingredient becomes infused with velvety plum liqueur, beguiling camellia japonica flowers and rare agarbois, casting an irresistible spell of ravishing beauty " before the journey ventures into a warm and sensual terrain of amber, benzoin Laos, fir balsam absolute, vanilla absolute and infusion. 'This fragrance began with a dream of the Silk and Spice Roads "t he ancient, Asian trading routes for luxurious and precious goods. I imagined caravans piled high with treasures, and being surrounded by a multi-sensorial abundance of opulence." " Tom Ford. Shanghai Lily is a floral Oriental scent that transports the senses into a world of rare and opulent ingredients from the historic Silk Road and Spice Route. Bitter orange, pink peppercorn and rich black pepper blend with the warm richness of clove. Jasmine, rose and tuberose, combined with the very contemporary addition of vetiver and luxurious cashmeran, create a sensual coupling of spices and florals. The golden treasures of benzoin Laos, castoreum, cistus labdanum and guaiacwood are touched with addicting vanilla and captivating frankincense, creating a hazy reverie of glamour and temptation. The Private Blend Atelier D'Orient fragrances are contained in the signature Private Blend bottles made of cognac-brown glass. The bottles are finished with a gold name plaque and packaged in brown boxes. 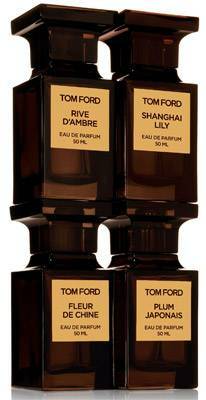 Tom Ford Private Blend Atelier D'Orient Collection will be available exclusively at David Jones City stores.